To run an operation on multiple nodes (bulk operations), select those nodes in List View and choose an appropriate action. Notifications appear when an operation starts and completes. Clicking Show Details takes you to the Activities page. Starts or stops the DataStax Enterprise process on a node. 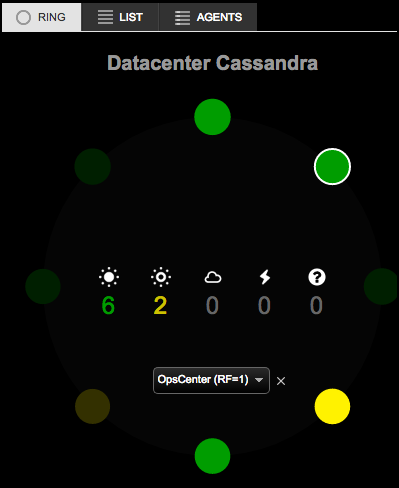 Restarts the DataStax Enterprise process on a node. If running restart on multiple nodes, each node is started as soon as the start command for the previous node returns. Tip: To run a rolling restart of all nodes in a cluster, select Restart from the Cluster Actions menu. Removes rows for which the node is no longer responsible. Cleanup is usually performed after changing the partitioner tokens or the replication options for a cluster. See Running cleanup. Performs a major compaction, which is not a recommended procedure for most DataStax Enterprise clusters. See Running compaction. Flushes to disk as persistent SSTables the recent writes currently stored in memory (memtables). See Flushing tables. Makes a node consistent with its replicas by doing an in-memory comparison of all the rows of a table and resolving any discrepancies between replicas by updating outdated rows with the current data. See Running a manual repair. Warning: Do not run a manual repair operation from Node administration or using the command line while the Repair Service is On. Forces the Java Virtual Machine (JVM) on the selected node to perform a garbage collection (GC). See Performing garbage collection. Removes a node from the cluster and streams its data to neighboring replicas. See Decommission a node. Causes the recent writes currently stored in memory (memtables) to be flushed to disk as persistent SSTables and then makes the node read-only. The node stops accepting new writes until DSE is restarted. Draining a node is usually done when upgrading a node. Changes the partitioner token assignment for the node, thus changing the range of data that the node is responsible for. Not available if vnodes are enabled. See Moving a node.